He What? …Jesus Hung Out with WHOM? I have heard it said many time… “Love the sinner, hate the sin!” But can we really separate the sinner and the sin so easily? I’m not saying that sin is ok. But it seems that to truly love sinners like Jesus loved sinners, that we must love them in the midst of their sins. Sometimes that gets messy, making the religiously folks uneasy and making us appear as “worldly sinners”. Welcome to the world of following Jesus! Over the next three weeks with the Columbia Church of Christ, we’ll be exploring from the Gospel of Luke what Jesus was doing that got him accused of being a “glutton and drunkard” as well as a “friend” and “guest” of sinners. 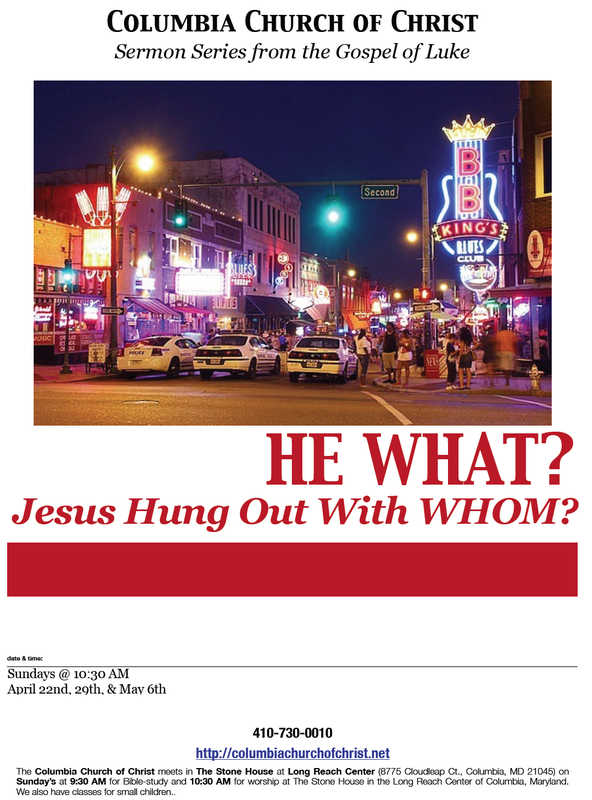 The sermon series title is “He What? …Jesus Hung Out with WHOM? I always look forward to preaching/teaching about Jesus Christ and the mission he calls us to follow him in. Since Jesus was in trouble in these passages it means that I get to see what sort of trouble I can get myself and others into…:-). Any ways, I’ll be posting recordings of the sermon on my blog under the “Columbia Church of Christ Sermons” page on this blog. This entry was posted in Columbia Church of Christ, Kingdom of God, Missions and Ministry, Preaching and Teaching, Scripture. Bookmark the permalink. I’ve been wrestling in recent times with the idea of “love the sinner hate the sin.” Doesn’t God define himself by his character, and isn’t his character demonstrated in his actions? If it applies in the positive, wouldn’t it apply in the negative. Don’t our sins make us (not sin) enemies of God? I think it’s a western, individualistic way of defining people. Honor/shame societies (ie biblical cultures) don’t seem to draw that distinction. Actions result in honor or shame that define the individuals. Is one of these worldviews right and another wrong? I don’t know about you but I would certainly go for the biblical worldview being the right one. 🙂 I do think we see the character of God in his actions, which is why the gospel of Jesus Christ redefine how we understand God’s righteousness/justice.